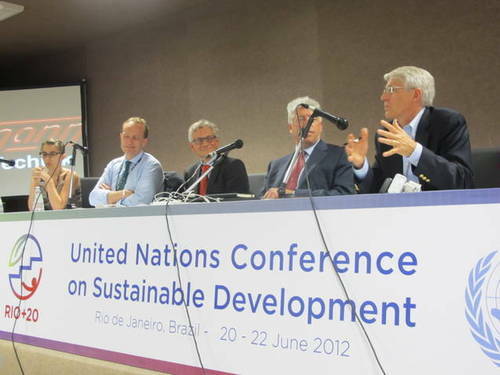 Yesterday at the Rio+20 Earth Summit I spoke on a panel about eliminating fossil fuel subsidies--a fitting topic for Dump the Pump Day back home. Getting rid of subsidies for the fossil fuel industry is a hot topic in Rio and around the world. More than a million people worldwide have called on their leaders to eliminate subsidies for this politically powerful, environmentally harmful, and immensely profitable industry; but there are significant barriers that need to be overcome in order to get the job done. The biggest obstacle facing fossil fuel subsidy reform in America is the political power of the oil industry, a power that stems from its virtual monopoly on our transportation system. If Americans want to move anyone, or anything, anywhere, we need oil to do it. The oil industry receives the majority of U.S. fossil fuel subsidies, and also presents some of the most entrenched political opposition to reform. Overcoming the political sway of the oil industry is no small task, but it is achievable, especially as we continue to work on four key issues: transparency in the reporting of subsidies; transparency in the political process, particularly in campaign contributions; breaking the oil monopoly on transportation; and mobilizing public action. First is the issue of transparent and accurate reporting of fossil fuel subsidies. Although there is a G20 mandate to report fossil fuel subsidies, these reports are misleading. They often cite dramatically smaller numbers than those identified by third parties in academia and civil society. That’s why NRDC joined seventy-five other NGOs in calling for world leaders to commit to greater transparency in reporting fossil fuel subsidies. This will be a necessary step for fulfilling international commitments to eliminate these handouts, which amount to $1 trillion annually. These direct fossil fuel subsidies only scratch the tip of the iceberg. The indirect subsidies are even greater. Fossil fuels generate pollution that causes asthma, heart disease, and cancer, and change our climate. In the United States alone, the public health costs of fossil fuel use exceed $120 billion a year, according to the National Academy of Sciences. And the effects of climate change, including extreme weather, declining food production, rising sea levels, and diseases, cost hundreds of billions of dollars annually. These indirect subsidies dwarf the direct ones by ten times or more. The real number for fossil fuel subsidies around the world likely approaches $10 trillion a year. These are the figures which should inspire governments to action. The second element of reform is greater transparency in the political process--letting the public know which elected officials stand in the way of reform, and who's paying them to do so. Even in this challenging fiscal climate, when governments are looking for ways to cut deficits, the fossil fuel industry has been able to leverage significant political power to combat reform. In the United States, the G20 commitment to remove fossil fuel subsidies has been championed by the Obama administration, but to no avail. For the last several years, the president has proposed eliminating the most obvious oil and gas subsidies from the U.S. federal budget, for a total of roughly $4 billion annually. But for three consecutive years, the U.S. Congress has not approved the cuts, and seems unlikely to act in 2012--a presidential election year. Why has a Congress so eager to slash government expenditures failed to make perhaps the most obvious cut of all? Because of the outsized influence the oil industry wields in the American political process. According to Oil Change International, the current U.S. Congress is on track to take more money than ever from the fossil fuel industry in direct campaign contributions--$16 million and counting. And that figure does not include the millions donated by the oil industry and oil barons to political action committees. The public needs to know who is paying our politicians. The third and perhaps most important element to overcoming this entrenched industry's political hold on the United States is to break its monopoly on transportation fuels. In Brazil, cars can fill up with CNG or ethanol, but in the United States, we are almost entirely dependent on oil as a transportation fuel. If we are going to achieve real fossil fuel subsidy reform and address the underlying issues of global warming, this must change. The American public needs more options for transportation. Vastly more efficient vehicles, alternative fuels, public transit, and mixed-use communities that allow people to walk and bike around, all must play a role in this process. We hope to see the expansion of electric cars and CNG trucks and buses. When Big Oil no longer has us by the throat, they will not be able to call the shots. The final step is to mobilize the public. The process has already begun. Early this week, in a fitting prelude to an Earth Summit that sought to enhance public participation, for twenty-four hours more than a hundred thousand people created a storm on Twitter, sending one tweet every second on the need to eliminate fossil fuel subsidies. It’s easy to see why people respond to this issue. Popular sentiment has been galvanized by the unprecedented profits posted by the oil industry in recent years, and in the increased understanding that in a global oil market oil, subsidies largely go to increase those profits. People are fed up with their governments shelling out money to industries that cause harm. And people are also excited about clean energy, excited about the prospect that eliminating fossil fuel subsidies will give these new, clean technologies a chance, leveling the playing field by reducing the cost differential. This outpouring of public passion needs to be magnified and not let up until change occurs. Coming out of Rio+20, it is clear that the public is expecting the international community to act to eliminate fossil fuel subsidies. This is an issue that isn’t going away.